1. a. A crucial or decisive point or situation; a turning point; ..from Greek krinein to decide. 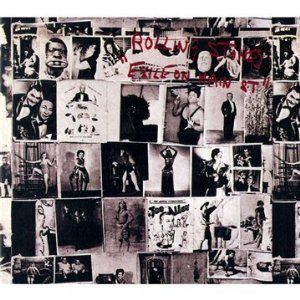 One of the things that make the Rolling Stones album, Exile on Main Street, interesting, and why so many people invest it with significance in the story of the Rolling Stones, is that it is a product of crisis. When the Stones collected themselves to begin assembling their first album of the 1970s, they were faced with a dilemma that everyone who had invested any sort of hope in the recently passed events of the late ‘60s was also facing. Like early Christians in A.D. 100 finally conceding that the Kingdom of Heaven wasn’t arriving any time soon, the vanguard of the cultural revolution had to figure out what to do now that the revolution hadn’t come. Just a couple of years before, rock and roll bands had been hierarchs working their magic to effect the great turning of the age that almost everyone who had anything to do with the “counterculture” was in one form or another anticipating. But Exile was recorded on the world’s great morning after, when everyone awoke and found themselves in the 1970s. The curtains were torn open to let in the glare of daylight, and for the first time you could see how pasty, bloodshot and unwell everyone really looked. And in that morning the Rolling Stones found themselves, like it or not, living out the question that the Beatles broke up rather than face—what meaning does mere rock and roll have when the energies that made you icons and avatars, that provided your music with half its meaning, have been turned off like a gas flame under a pot? How much of your greatness was your music, and how much was the moment? What is rock and roll supposed to do when it becomes merely music, and not a huge cultural signifier? 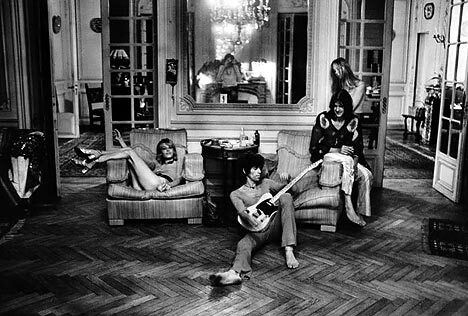 ‘What is rock and roll supposed to do when it becomes merely music, and not a huge cultural signifier?’: lounging around Nellcotte, the luxurious villa overlooking the South of France, rented by the Stones for purposes of recording Exile On Main Street therein, are, from left: Anita Pallenberg, Keith Richards, Mr. and Mrs. Gram Parsons. Exile on Main Street is a great rock and roll record because it is, in a way, a brave one. The Stones did not flail in a vain repetitive effort to keep the magic going. Neither did they adopt a radically new identity, an option frequently taken by threatened pop stars. Instead, they instinctively went back to first principles. They did some serious reflection on their musical mentors and they noticed, perhaps for the first time, that American bluesmen and country singers saw their music as a lifetime’s vocation. So that’s one thing Exile is—an affirmation that rock and roll contained enough truth and complexity to make it one’s life’s work, just as much as the blues. This is the key to what turned a heedless and fairly dangerous group of young men into the archetypal rock and roll survivors. This is the place where their generation-spanning stay in the charts really begins. Exile is, at first listening, an album from a band that is clearly off its peak, and knows it. Exile sounds tired. 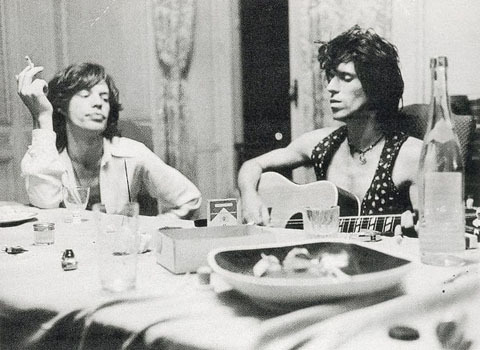 Mick’s vocals are de-centered, no longer taking pride of place in the mix, coming from some throttled place in his throat, mirroring a contracted emotional range that would never again be capable of a “Ruby Tuesday.” Where once Keith’s lead lines burned and stung, there was now way too much affable picking. Charlie Watts, the greatest of rock and roll drummers, often seemed to be following after the band rather than setting the pace. The slippage was undeniable. ‘Rolling slow and murky as a river of mud, but with a deep, churning, groove that irresistibly sets all the lower chakras vibrating, ‘Tumbling Dice’ is the the last of their extraordinary streak of 45s that defined the rock and roll single.’ Montreux rehearsals, 1972. Yet, such is the level of their talent that the Stones turned this miasma into a groove. This can best be heard in the album’s hit, “Tumbling Dice.” Rolling slow and murky as a river of mud, but with a deep, churning, groove that irresistibly sets all the lower chakras vibrating, it is the the last of their extraordinary streak of 45s that defined the rock and roll single. When the Stones return once more to the Robert Johnson songbook for “Stop Breaking Down,” it’s clearly as a band with fewer guns than the one you hear on, say, “Parachute Woman” on Beggars’ Banquet. Yet the rhythm they finally find in the song is so potent that it affirms, once again, that the Stones, when they chose to be, were the greatest white blues band ever. …sang Mick the Lord of Misrule, one of a gallery of preternaturally vivid and luridly lit personae he enacted. You’ll look in Exile in vain for Jumpin’ Jack Flash, the Midnight Rambler, or a certain discrete gentleman of wealth and taste; nor will you encounter that black-clad corybant who danced across fevered 1969 America with an Uncle Sam hat on his head and an omega sign on his chest. No, by 1971 the Stones had excused themselves from their own masked ball, wisely, no doubt. They had probably gotten the message, maybe at Altamont, maybe at Brian Jones’ woodland cottage, that appropriating too much glamour invites a nemesis. There was likely more than one motivation for the Rolling Stones decision to keep rocking—surely there were financial and career considerations. Rock and roll had made these five young men very wealthy and offered them a lifestyle that they could hardly picture an alternative to. And it was clear that they could not go on playing with symbols that carried no voltage outside of their fast-receding moment. They had to invent something that could please on a simpler level, and the solution they began to sketch out on Exile proved phenomenally successful. Here are the roots of the Rolling Stones as one of the most dependable arena-fillers in the rock biz. With Exile on Main Street the Rolling Stones had at last produced a version of themselves that the ordinary American boy could feel completely easy with, the general level of outrageousness having risen so high in recent days that the Stones’ tales of whiskey and women now made them seem less like jaded London roués and more like Lynyrd Skynyrd’s crusty uncles. And they didn’t just decide to keep rocking in the face of a new and foreign zeitgeist; they put out an elaborate double album, the clear sign of a statement being made; a double album that was a dramatic affirmation of their roots, that leapfrogged the whole (now- problematic) era of the ‘60s in a bid to link the Stones in an unbroken chain with the pre-‘60s musics of the American south. In its rootsiness, Exile advertises on every cut what it was that would enable the Stones to survive and prosper—it was the fact that they represented, and stood with, a genuine musical tradition that preceded and informed their music. They could only make the transition from the ‘60s universe into the post-‘60s world by staying close and clinging tight to that tradition. It was the absence of a recourse like this that, among other things, made the Beatles unable to persist past the end of their decade. 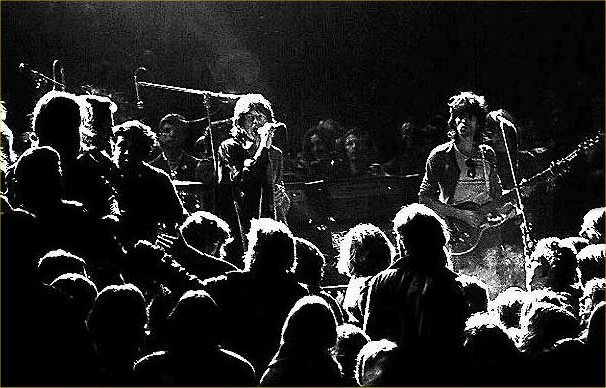 That the musical traditions that flowed into the Stones’ rock and roll at the beginning of the ‘60s possessed interest, excitement and history enough all by themselves, unadorned by any borrowed cultural interest, was the central idea of Exile. It was with this affirmation—that mere rock and roll was sufficient —that they founded post-‘60s rock and roll. 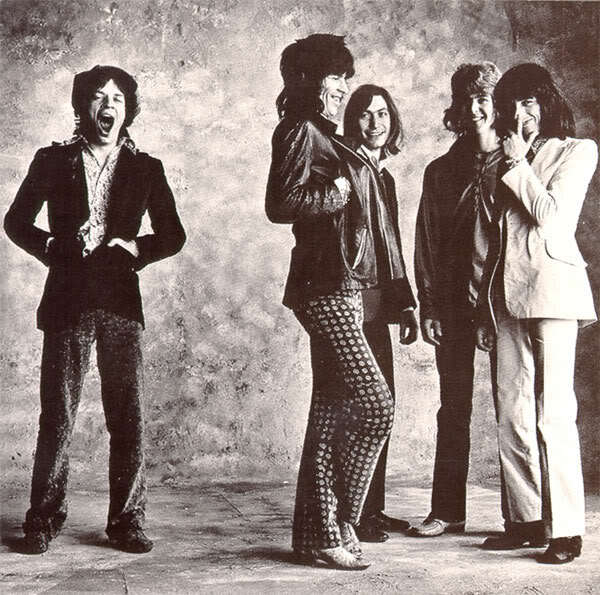 Not that the music on Exile had a terrific effect on other bands in terms of sound or style; instead it was felt in the fact that the Rolling Stones so powerfully endorsed the validity of continuing to play the music. To the punks, who emerged just a few years after Exile, the Stones were a symbol of the enemy, one of the “dinosaurs” of the Rock Establishment. Yet Exile on Main Street is at least partly responsible for the fact that playing rock and roll was even an option for Joe Strummer and John Lydon. With Exile on Main Street the Rolling Stones had at last produced a version of themselves that the ordinary American boy could feel completely easy with, the general level of outrageousness having risen so high in recent days that the Stones’ tales of whiskey and women now made them seem less like jaded London roués and more like Lynyrd Skynyrd’s crusty uncles. You could hear this developing in songs like “Wild Horses” and “Moonlight Miles” on Sticky Fingers, the album that immediately preceded Exile, but it’s the core of Exile. In songs like “Loving Cup,” “Soul Survivor” and “Torn and Frayed” Mick was detaching himself from complete identification with his role as rock superstar, and so had found an ability to poke wry fun at his prematurely worn-out self—is that really Mick Jagger confessing that he only gets his rocks off when he’s dreaming? Yes, apparently. The Stones were also clear-eyed enough to acknowledge that much of their source music came from people for whom faith, in some form, was an issue. The hoodoo spiritual “I Just Want to See His Face,” with its demand for immediate and direct religious experience, hinted that rock and roll and spirituality are not neatly separable powers.“Following the River,” one of the 10 outtakes included with the remastered Exile CD, contains a revelation: Mick, the gifted mimic of black singing styles, doing some pure open-hearted, out of control testifying, finally grasping the truth of soul music, not just its style. The declining powers and fatigue that the Stones so cleverly turned to their advantage on Exile turned out to be permanent—there was to be no return to form, just a lowered set of expectations. The great fear of the ‘60s star turned out to be true—the historical moment was a crucial factor in their art. The inspired gambit that had turned their exhaustion into a concept album about exhaustion could not work twice. Some see Exile as a triumph for the Stones, as a band reconstituting themselves in their tough-minded way for the long haul. To me it’s a brilliant valediction, as much a conscious capstone and a goodbye-to-all-that as The Plastic Ono Band or the Long Medley on Abbey Road. No, Exile on Main Street is not the Stones’ greatest album. But it is the last Rolling Stones album that mattered, the last record from the world’s greatest rock and roll band.